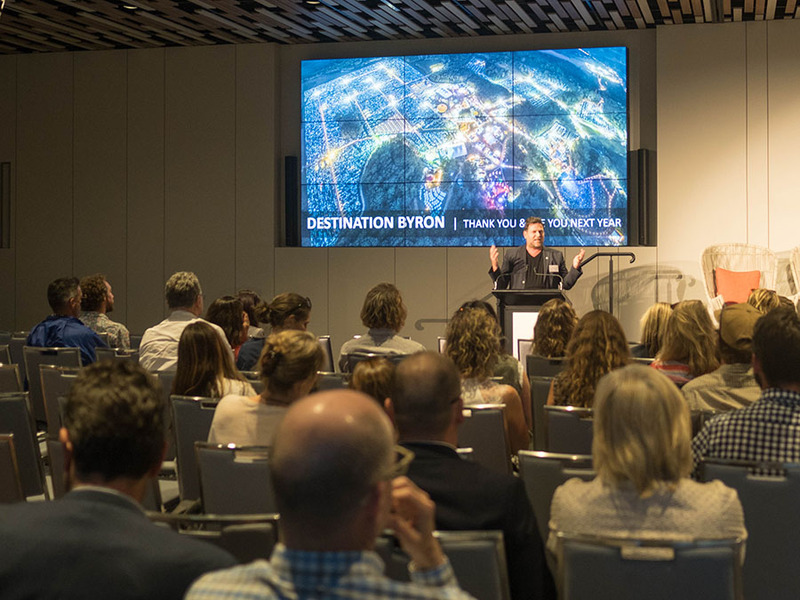 The theme Beyond The Byron Boom, How to Ensure Our Visitor Economy is Sustainable, allowed the local industry to come together for a one day conference at the Elements of Byron Resort and share some detail on how different sectors are working toward a sustainable visitor economy. The event began with an introduction by Cr. Simon Richardson, who did an excellent job as MC with insight and humour, followed by Delta Kay’s engaging Welcome to Country. The program started with Stephen Mahoney and Anthony Laver of Destination NSW, presenting Projections and Updates on the efforts of DNSW and sharing data and statistics on the industry from a State perspective as well as detailing the many support services they provide to operators. This presentation shortly followed a 3 minute screening of the Tourism Australia international advertisement with narration by Byron’s own and Toursim Australia’s ambassador, Chris Hemsworth. Vanessa van Uden, a past Mayor of Queenstown New Zealand, presented a real-life experience of Queenstown. She highlighted some of the strategies used in New Zealand to manage and fund the impacts of visitor growth and how the town and residents can stand to benefit from a well managed visitor economy. Liz Price, the General Manager of Great Ocean Road Regional Tourism discussed the Strategic Master Plan for her region, which until recently went without any central management or coordination. Liz highlighted the issues they face with a fragmented industry servicing 5 million (mostly day trippers) each year. The 140 or so attendees then enjoyed a Local Producers Morning Tea supplied by Nimbin Valley Dairy, Salumi Australia, Brookfarm and Byron Bay Cacao. The first panel discussion focused on the Sustainability of the Events Visitor Economy, facilitated by Cr. Simon Richardson with Jane Magnus, Jen Murphy, Mat Morris and Chris Hanley. A mature industry pointed out that better regulation and better infrastructure would help the events industry, and, the importance of event managers sharing best practice improvements amongst themselves in order to stay ahead of emerging changes. Before lunch, Anthony Laver, David Jones and Brenda Miley, facilitated by Cameron Arnold, discussed Defining Brand Byron. The consensus was it’s the feeling of Byron that best defined the brand, as there are beautiful beaches, great restaurants, exciting festivals, etc. all over the world – but only one Byron Bay. A quick lunch with time to stretch before Pam Brook facilitated the Heroes of Regional Tourism discussion with Tom Lane, Brooke Hudson, Sue Walker and Jasmin Daly. They each talked about change, collaboration and the importance of allowing staff to work to their own passion. The program ended with Delta Kay, Vanessa van Uden, Liz Price and Carly Weiland discussing How Will Byron Tackle Quality vs Quantity facilitated by Jane Laverty. The lively discussion ended up with the idea that a quality service or experience will encourage the desired quality of visitor behavior and that our industry needs to continue to improve its product and service delivery to continue a positive change in this aspect. The attendees finished the day with a drink supplied by Brookie’s Gin and Stone & Wood, and some networking. Overall, the theme of people and collaboration ran through every discussion, with the best, simple idea coming from Delta Kay who suggested we all greet Byron’s visitors with ‘Jingi Walla’ (Welcome).